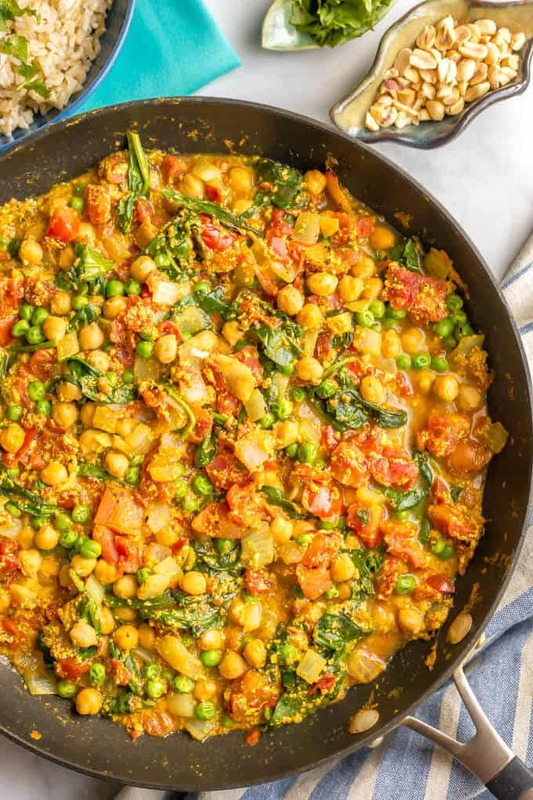 This quick and easy vegetarian curry is loaded with chickpeas, spinach, green peas and plenty of warm spices for a bright, beautiful and flavorful dinner! I am SO excited for this week! My husband and I had our 10-year wedding anniversary last fall, but I was out of town and besides some sweet cards, we didn’t really celebrate. And the wait is almost over! In just a couple of days we are heading to Costa Rica for a long weekend of sun and fun! I started packing yesterday cause I’m just so excited for this trip! Ahhh, is it time to board the plane yet because I am READY! Today I’m sharing with you a new favorite meatless Monday dinner. It’s easy enough for a weeknight but also so satisfying. 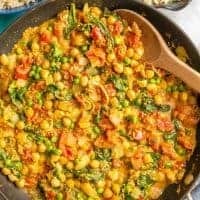 My vegetarian curry is made without coconut milk. 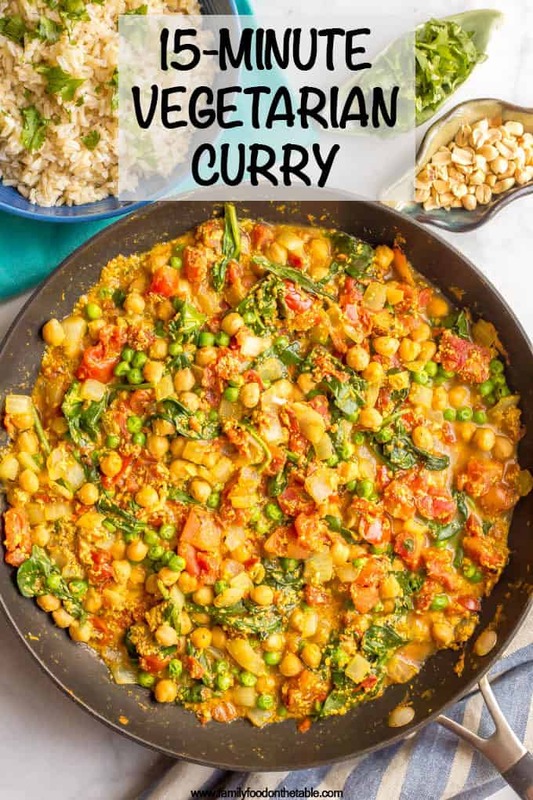 I’ve had curry with it and I like that too, but this is just my easy go-to with ingredients I always have on hand. 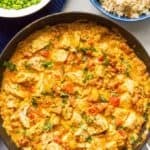 And just like my quick chicken curry that this is based on, it’s maybe not traditional and maybe not super authentic, but I’m OK with a few shortcuts that get dinner on the table and still have ALL the great flavor! The toppings here are optional, but I highly recommend you pick at least a couple of them! 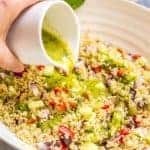 The herbs and the lime juice add such great freshness, and the peanuts give it a really great crunch factor. My husband usually adds some grilled or rotisserie chicken to his, so if you have non-vegetarians, that’s an easy option. If you want to use coconut milk in place of the Greek yogurt and milk, you can. Just substitute a 13 oz. can. 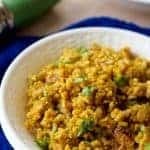 You may need to add a couple of tablespoons of your flour of choice and let the mixture simmer for a little longer to help the curry thicken. 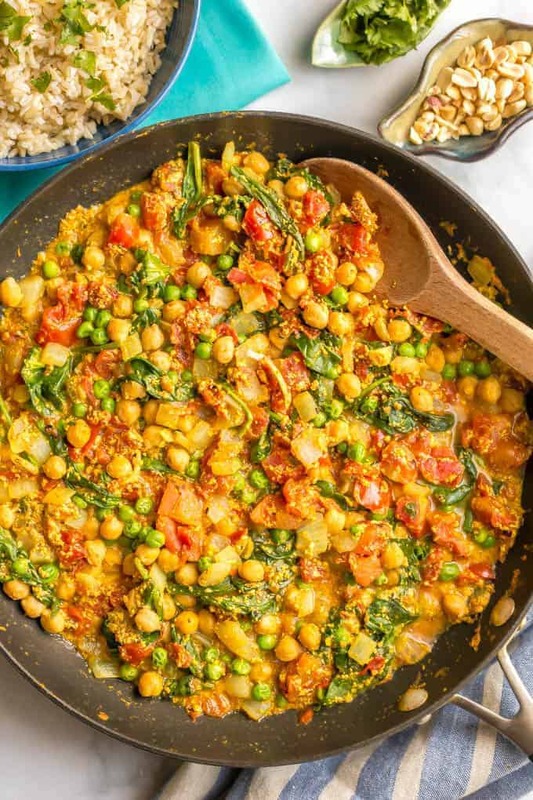 We love this veggie curry served over steamed brown rice, but basmati rice, couscous and even cauliflower rice would all be great here! Oh, and also, I’ve never had an issue, but some people do have problems with milk or yogurt curdling when they add it to a curry. Milk and yogurt can curdle if it heats too quickly, or if it comes to a boil. You may want to lower your heat or briefly remove the pan from the stove when you add these ingredients to help prevent curdling. 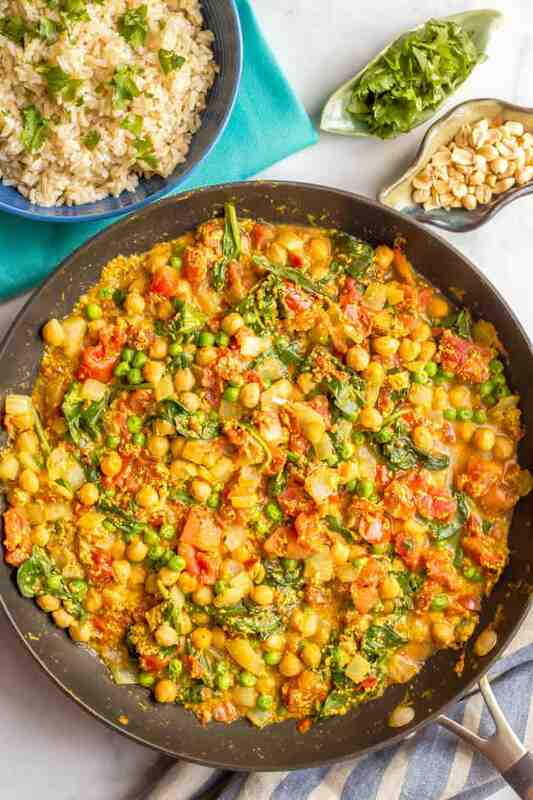 This quick and easy vegetarian curry is loaded with veggies and warm spices for a beautiful, flavorful dinner! Add onion and sauté for 4-5 minutes, until softened. Add garlic and sauté another 30 seconds. Stir in curry powder, diced tomatoes, Greek yogurt and milk. 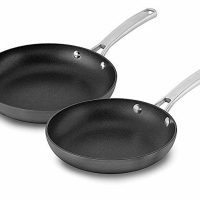 Season with salt, pepper and cayenne, if using. Bring to a simmer and cook for 2-3 minutes, until slightly thickened. 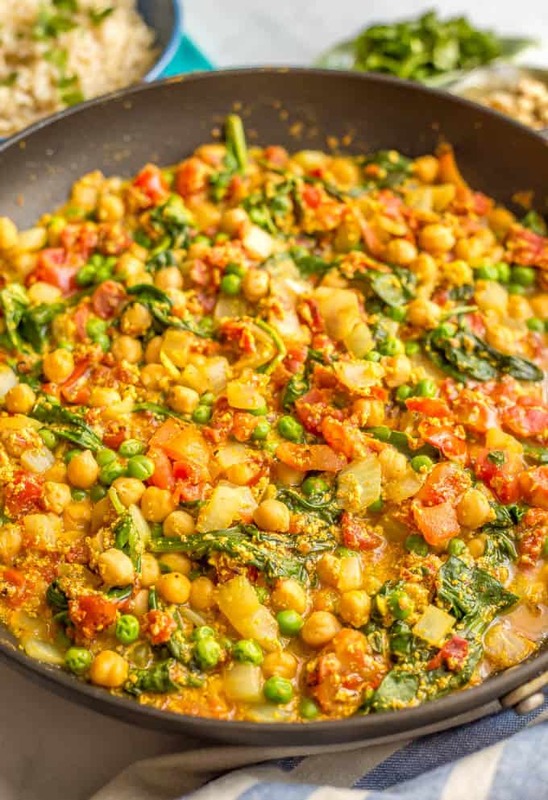 Stir in chickpeas, spinach and peas until warmed through and spinach is slightly wilted, 1-2 minutes. If you want to use coconut milk instead of the Greek yogurt and milk, just substitute a 13.5 oz can. 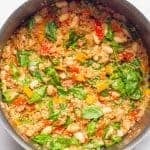 You may need to add 1-2 tablespoons flour of choice and let the mixture simmer for longer to help it thicken. Some people have an issue with curdling. Milk and yogurt can curdle if it heats too quickly, or if it comes to a boil. You may want to lower your heat or briefly remove the pan from the stove when you add these ingredients to help prevent curdling. 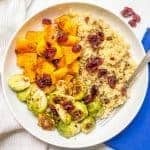 We love this served over steamed brown rice, but basmati rice, couscous and even cauliflower rice would all be great here! I’m a huge curry fan too! We’re lucky that it’s a pretty short trip for us! Still definitely something we had to save for but I’m excited it’s here!! Does this freeze well? Just made this to take to a family only to find out they already have some meals coming in right now. Would like to freeze this for them to use in a couple of weeks. Hi Jane! 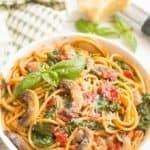 I’ve never frozen this (only because we never have leftovers!) but I imagine it would be OK. And what a sweet friend you are! I hope they enjoy it! I love this recipe for fuss free dinners. Packed full of amazing flavors! This is perfect for weeknights! Hi Lisa, I’m so sorry to hear that! I’ve never had a problem with curdling (either milk or Greek yogurt) in any of my curries, but I know some people do. 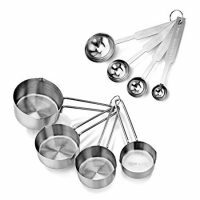 Milk and yogurt can curdle if it heats too quickly, or if it comes to a boil. You may want to lower your heat or briefly remove the pan from the stove when you add these ingredients to help prevent curdling. (I’ll add that note to the notes in the recipe card here, as well.) Hope that helps!